Bourbon is probably my favorite spirit, overall. And I LOVE me a good brew. So, logically combining the two would make me a very happy boy. Does it work? How could it not? 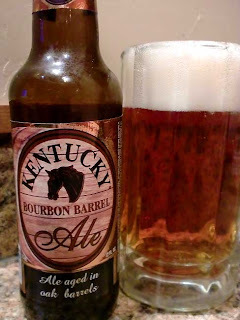 Previously, I reviewed the standard Kentucky Ale from Lexington Brewing Company, an Irish Red/English Pale Ale hybrid. This is that beer's big brother. The standard is 5.34% alcohol, whereas this bad boy is 8.19%, placing it firmly in the American Strong Ale category. According to the Lexington Brewing Company their Bourbon Barrel Ale is aged for up to six weeks in freshly decanted bourbon barrels from the distilleries of Kentucky. Anyone familiar with Jim's Beam's new bourbon, Devil's Cut, knows that the barrel wood still contains plenty of soaked in bourbon after it has been drained. Kentucky Bourbon Barrel Ale pours a clear, copper color and makes a moderate head with some coaxing. It smells like boozy bourbon, with lots of vanilla and oak, and a bit of sweet caramel malts. The first sip caught me off-guard. Whereas I've had several beers aged in oak or ex-bourbon barrels, they have all been porters or stouts, which makes the bourbon notes more hidden and subtle. This is far from a stout, so when it hit my mouth I went, "What in the...?!" Bourbon, bourbon, bourbon. Lots of vanilla, lots of oak, some semi-sweet malts, with the classic Irish Red taste in the background. Hops? Nope, not here. Due to it not being a porter or stout, the bourbon goes from background subtlety to full-Monty foreground attack. Okay, maybe it's not an attack, but this brew tastes like 80% moderately dry bourbon with the alcohol bite taken out, with lingering beer characteristics. I bet the standard Kentucky Ale taste is hiding somewhere in there, but I can't hardly find it. Very, very unique and most definitely a sipper. This beer has won several awards, likely because it's so unlike just about everything else. I should have served it in a snifter or red wine glass instead of my usual mug, but alas, I was unprepared for what awaited me. Drink This: if you want to try something extremely unique, assuming you enjoy bourbon and beer. Don't Drink This: if you don't like bourbon or are an elitist who thinks only dark beers should be aged in oak. This is very bourbon-forward and as such, could be an acquired taste perhaps. I enjoyed it, but my wife didn't even like the smell. But then again, she doesn't like beer or bourbon. Go figure. Kentucky Bourbon Barrel Ale is worth trying, if at least just once.